Named the "White Headland" by ancient Greeks 2,500 years ago due to the brilliant light from the clear skies and the fine sandy beaches, the Costa Blanca, on the coast of Alicante province, has been a holiday favourite for many years. Benidorm may have been the first well know place in the area and did not always have a good reputation. However it has reinvented itself and is a firm favourite with many. Further south, Torrevieja has also developed into a large lively resort. North of Benidorm, are to be found the more subtle destinations of Calpe, Moraira, Javea and Denia, from where ferries make regular trips to the Balearic Islands. The Costa Blanca is also well supplied with Golf Courses. 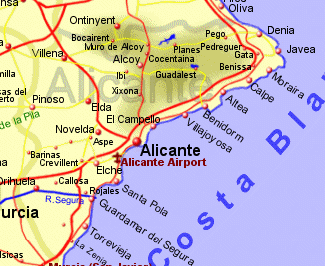 The Costa Blanca is serviced by Alicante airport, with all parts of the costa being within 1hrs drive, while Murcia airport at San Javier is an option for the southern end of the costa.